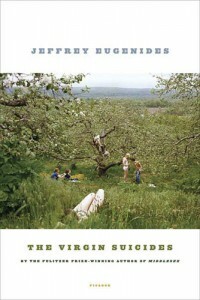 Appropriately described, Jeffrey Eugenides’ The Virgin Suicides makes myth of “suburban middle-American life” (back cover, paperback edition). This brilliant debut novel is from the author made famous by his Pulitzer Prize-winning follow-up, Middlesex. Had I read this one first, the quality of Middlesex (one of my all-time favorite reads) wouldn’t have been so surprising. The Virgin Suicides is indeed a modern myth. The narrator is a chorus – the group of boys who are peers of the five daughters of the Lisbon family, who all commit suicide within 12-month period. The girls are a mystery to the boys, protected, or more aptly isolated, by their parents whose motives are never fully revealed. The boys, now adults, tell the story of their limited exposure, offering episodes and items collected (photos, journals, notes) as “evidence” as if together they have carried the burden of the girls’ deaths and are seeking absolution. The beginning of the narrative plot is the first suicide, Cecelia. Circumstances of her death, including a lack of grief from her family and the fact that her body remains unburied (there’s a strike going on by the cemetery workers), parallels conflict found in Greek tragedy, most notably Sophocles’ Antigone. The remaining sisters, like Sirens, lure the boys in with song, not to the boys’ deaths, but to aid in the culmination of theirs. Along the way, commentary of life in suburban America abounds. Secretly, neighbors watch each other with keen curiosity, but maintain decorum in the polite distance they acknowledge. Mr. Lisbon, who teaches at the high school his daughters (for a time) and the boys/chorus/narrators attend school, seems inconsequential to the ‘Day of Grieving’ the school hosts – a wry attempt to mark the solemn passing of a fellow student. Ultimately the chorus decides that it is the girls who are guilty, guilty of abandoning the boys, their fellow occupants in life – however mundane in its suburban-ness – instead of joining with them to confront, perhaps endure, but ultimately exist and prevail in what Destiny has offered. 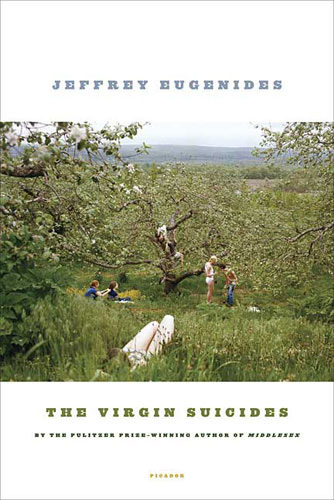 At fewer than 250 pages, The Virgin Suicides is a short read, but it is dense in content worthy of examination, thought and discussion. I’m currently reading Middlesex, so I had to stop by & see this review. I’m a bit reluctant to read The Virgin Suicides as it seems really heavy & depressing. The movie was all right, but probably not as complex as the novel. Middlesex is interesting so far & Eugenides is quite a captivating writer. T/L – I’d give it a try sometime. It isn’t as heavy as you might think. I hope you enjoy Middlesex!